NEW BRITAIN - Guitarist Peppino D’Agostino will be holding a workshop at Central Connecticut State University and performing in Hartford on Saturday, Oct. 20. D’Agostino has released 18 albums and performed in over 33 countries. In a 2017 issue of Guitar Player magazine, D’Agostino was listed as one of the 50 “transcendent superheroes” of the acoustic guitar, according to a press release. 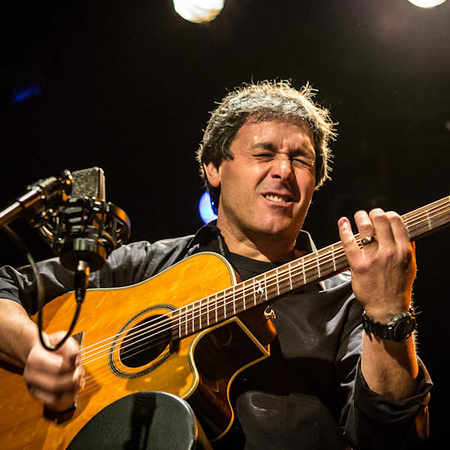 According to ctguitar.org, D’Agostino emerged as an acoustic guitarist in the early 1980s as a leader of the second wave of stylists who helped redefine the instrument in the 1990s. “Penumbra,” the artist’s latest solo CD, was recently released by Mesa Blue Moon Recordings. D’Agostino has shared the stage with well-known artists including Larry Carlton, Eric Johnson, Tommy Emmanuel, Leo Kottke, Martin Taylor, Roland Dyens and David Tanenbaum, according to the press release. The workshop will take place at 2 p.m. in the Elihu Burritt Library at CCSU, 1615 Stanley St. The Hartford concert is at 8 p.m. at the Asylum Hill Congregational Church, 814 Asylum Road. For tickets, call 860-249-1132 or order online at ctguitar.org/2018/10/20/guitar-day-saturday-october-20-2018/?hilite=%27peppino%27%2C%27d%27Agostino%27#tickets. Posted in The Bristol Press, Arts, General News on Tuesday, 18 September 2018 21:03. Updated: Tuesday, 18 September 2018 21:06.